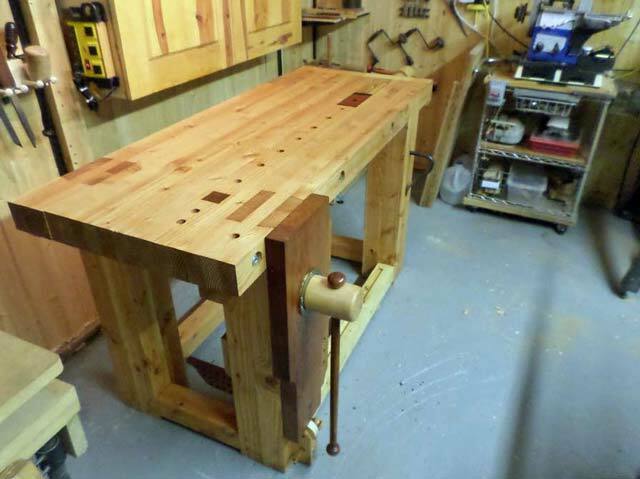 As we close out 2015, we have a tremendous workbench idea that combines the best of a Roubo mixed with a Shaker Style bench from Jeff J. who hails from Noblesville, Indiana. This is one fine workbench that has plenty of storage for Jeff’s tools but also plenty of capacity & space to clamp whatever is being built. Dear Sirs, my son finally convinced me to send pictures to you of the workbench I built 3 years ago with lumber that I accidentally stumbled onto while attending a small Estate Auction. I was able to purchase 14 pieces of 3” x 5” x 80” rough cut maple boards for $100 and decided at that time to build the workbench I had always dreamed of building. I spent the next weekend planing and finishing the wood and assembling the frame and top. My son helped me assemble the main bench with recessed lag bolts which are covered with 1/8” thick walnut plugs which allow the workbench to be broken down for moving at a later date if necessary. The following two weekends were spent building the center drawers and storage compartments for all of my wood working hand tools and wood planes. This storage cabinet measures 19” tall x 24” deep x 58” long and consists of 12 individual sliding drawers with the main carcass being built from 3/4 birch plywood. The face frame was built from walnut and the drawer fronts were built from walnut and curly maple with solid brass knobs. The back side of the storage cabinet was partitioned off into 9 individual shelf areas for storage of my larger wood planes. 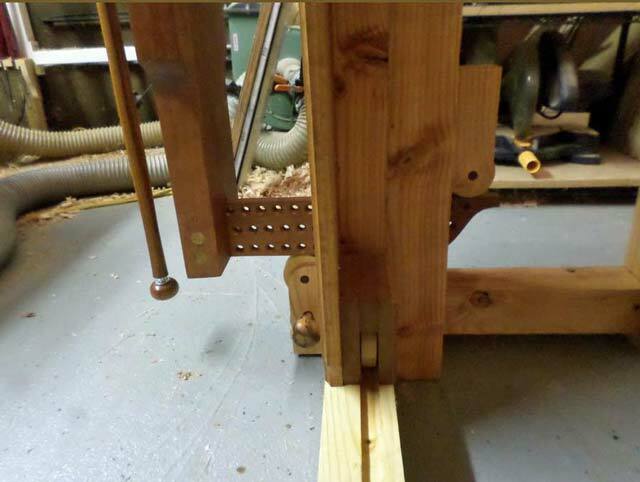 Another weekend was spent mounting the leg vise and end vise and putting the final touches to the project. The workbench stands 34” tall and is 30” wide by 72” long and weighs in at a hefty and very stable 450 pounds. The workbench was finished off with several coats of boiled linseed oil while the drawer fronts were finished with several coats of clear satin polyurethane finish. The workbench has become the centerpiece of my woodworking shop and the envy of all of my woodworking friends. 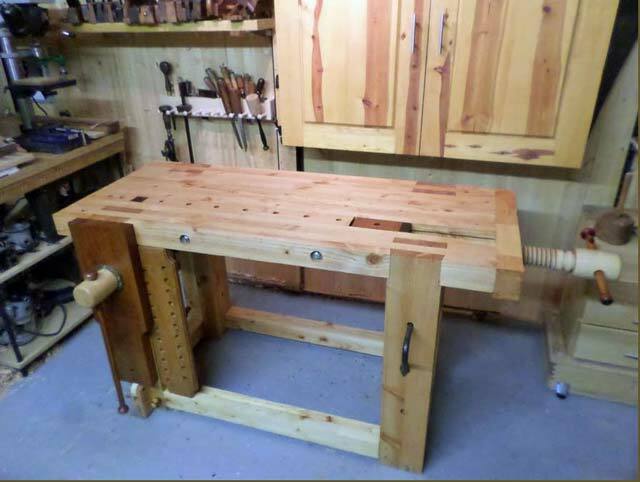 As a part of our impending Lake Erie Toolworks website transition, we are also changing up our Workbench of the Month feature to become “Workbench Ideas”. The reason behind this is that we have over 5 years worth of amazing workbench ideas from over 60 customers that everyone can use as an inspiration for creating your own workbench masterpiece. We trust that you all will enjoy this great feature and we encourage our customers to keep the workbench ideas coming. 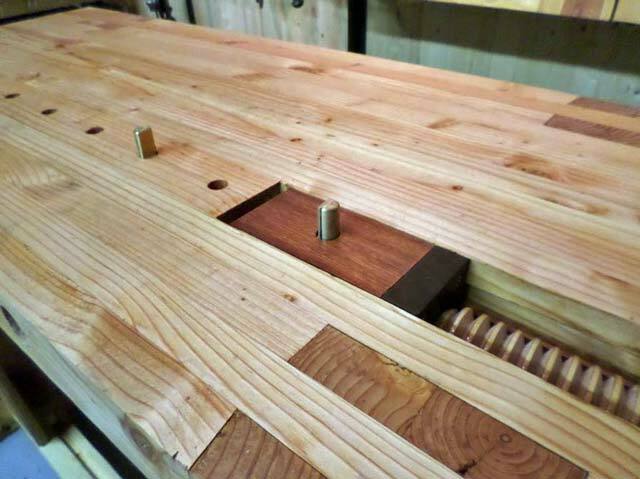 Our latest Workbench Idea comes to us from Allen M. from Charleston, West Virginia, who has built a tremendous Roubo style bench with an added Wagon Vise. Allen also added a great roller glide system to help support the leg vise & parallel guide mechanism. Tremendous job! I am a huge Lake Erie fan and I’ve had two screws sitting around for almost 2 years planning my bench. I wanted to do a wooden screw wagon with a long throw. I’m a hand tool guy. You asked for the dimensions. The whole thing is mostly douglas fir (for stiffness). The bench is 59 1/2 inches long, 25 1/2 inches deep, and 34 7/16 inch tall (weird, I know, but I measured, and trimmed to fit). 4-9/16″ top of 16 raw douglas fir taken down with band, jointer, planer, etc. Laminated with Titebond 3 and clamped with Bessey. Legs are laminated down to 8×8″.Everything mortise/tenoned and drawbored. The only hardware you see is 3/4″ allthread and the vise fittings. The wagon, which is what I’m most proud, is a block of bloodwood with an ebony spacer connected to your thread with a bearing. Some exotic wood in there, etc. I have a video of the leg vise spinning like a maniac. I’m happy to provide it to you, as I’m so impressed with your screws. The first question I’m asked is, “did you make those?” and I have to say, nope, Lake Erie made them. I’m your biggest fan, so if you ever need anything, just ask. I’m “bertha” on lumberjocks. Douglas fir workbench. 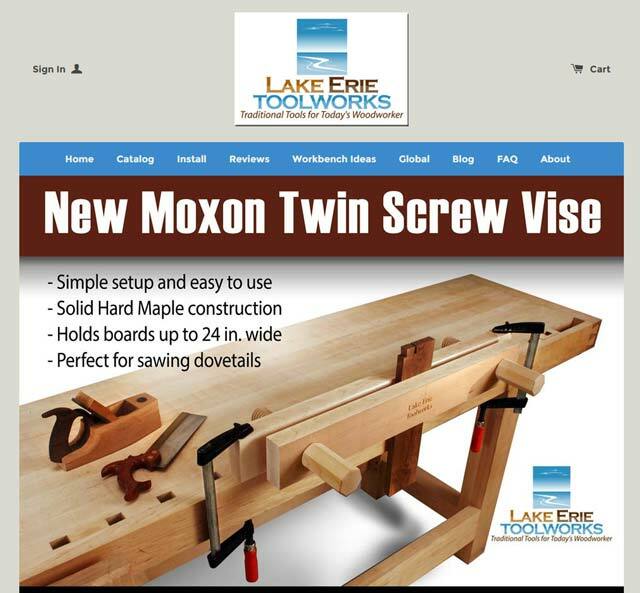 Maple leg and wagon vise screws are from Lake Erie. Leg chop is figured cherry through tenoned and drawbored to cherry parallel guide. Marblewood parallel guide stop and hickory wheels turned from baseball bat blank. Crank is Goncalo with bloodwood knobs. Deadman is walnut and rides on hickory wheels. 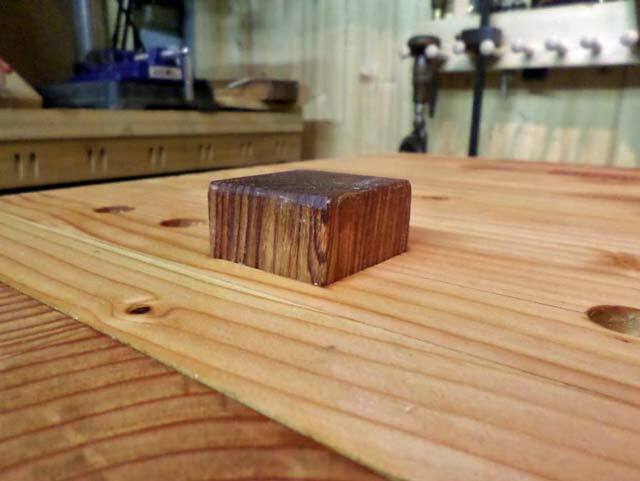 Wagon block is paduak with an ebony spacer. Rides on UHMW plastic guides. Crank is cocobolo with redheart knob. 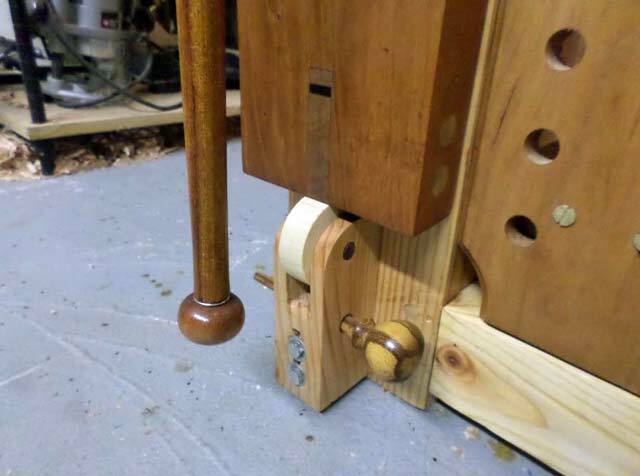 Rosewood plane stop friction fit with a dowel to raise. 3/4” allthread and titebond 3 to hold it all together. Legs and stretchers flush, all drawbored. Top handplaned but mostly machines on the rest. Holdfast from Scotty B. Brass dogs and LV plane stops. Finish is simple heated BLO.